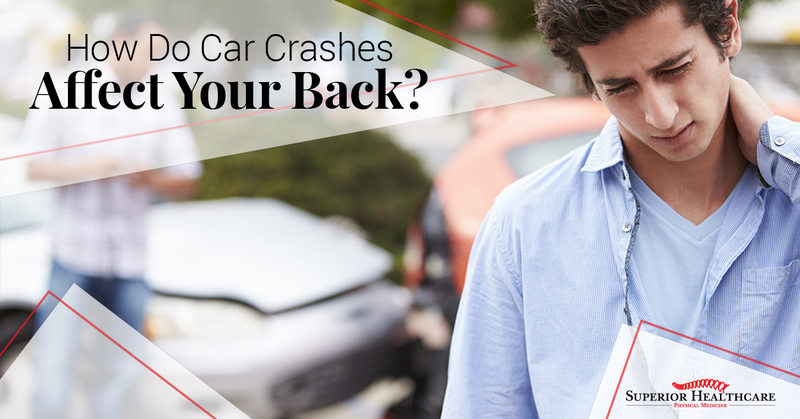 Chiropractic Health Center Metairie: How Do Car Crashes Affect Your Back? It is unfortunate, but car crashes happen. In fact, they happen more than you would think possible. In 2015, alone, there were over six million car crashes. Of course, this statistic ranges from small fender benders to destructive, even fatal, car accidents. It is a sad truth that car accidents happen, and in many situations, the accident could devastate you and your family. Obviously, some crashes lead to terrible outcomes, such as death or paralysis — both horrendous outcomes for anyone. However, even smaller accidents could have life-long consequences, especially when it comes to your back and neck. In this blog, we will discuss the areas that have statistically been damaged the most in car accidents. By learning which areas have the greatest potential to be injured, you may be able to figure out what type of pain you are feeling and where to go if you need a chiropractor. If you are in an accident, you will typically suffer a bit of soreness the day after. Though a bit of soreness is nothing abnormal, if your body pain lingers, then it may be time to meet with a local chiropractor. In Metairie, Superior Healthcare is here to assist you and your chiropractic needs. On staff, we have experienced professionals ready to help you get through this difficult time and get rid of some of your body stiffness. Not only does Superior Healthcare have an incredible chiropractic service, but we also have physical therapy and rehabilitation services as well. If you have been in a car accident, don’t silently suffer. Address your body pain now before the issue becomes permanent and painful. Spinal pain, or discogenic pain, is typical after a car crash. Ultimately, this type of pain will occur when the spinal discs incur sudden or acute trauma. A car accident directly can impact your discs as they are moved quickly forward and back. This movement forward and backward violently is called whiplash and is the movement that can negatively affect your back and your neck. If you are suffering from back pain, it is typical that you will feel the pain in your lower back. The majority of vehicle crash victims will often feel pain in their lumbar (lower) areas. Strain on this lower back area can be extremely painful and difficult to fully treat. Because this issue is muscular, you won’t be able to diagnose the problem with imaging. Instead, a chiropractor will be able to feel the muscles and judge based on the pain you are feeling whether this area is damaged. If you have a lumbar injury, the best way to treat this issue is by taking over-the-counter pain medication and rely on physical therapy. This occurs when the bone channel that houses the spinal nerves and the spinal cord is narrowed. This can happen for two reasons. The first is that the human body can naturally narrow this channel through aging. The second reason this happens is if you have been in a sudden and violent car accident. Spinal stenosis will occur when a small bone fragment or a ruptured disc is lodged into the spinal canal space. This infraction will cause severe nerve pain and can even damage the spinal cord. Disc herniation occurs when there is an injury to your spinal discs. These discs are responsible for separating your vertebrae and cushioning them from each other. In a car crash, it is common for the discs to be affected. In disc herniation, the soft, inner filling of the disc is shifted out of place. This itself isn’t necessarily painful, but, your back is a precise network of nerves and tissue; one misplacement could affect the whole system and cause severe back pain. There are many disc disorders, as one simple shift or nick to the back could cause issues and pain. Most of the degenerative spinal disorders, however, relate to the spine breaking down or not functioning properly. For instance, something as small as disc misplacement could be classified as a spinal disorder. If you have been the victim of a car crash and are experiencing back pain, perhaps it is time to see someone about it. If you are living in Metairie, visit Superior Healthcare today for premier chiropractic services.